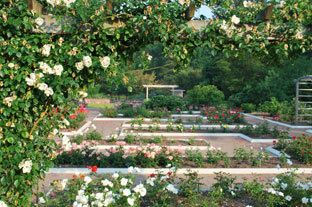 The Rudolf W. van der Goot Rose Garden is one acre in size and contains more than 3,000 roses of 325 varieties. As an accredited All-America Rose Selections (AARS) display garden, it is entitled to display AARS award-winning roses one year before their release to the public. The garden was named in honor of Rudolf W. van der Goot, the first horticulturist with the Somerset County Park Commission, as a tribute to his efforts in designing and developing the garden. The purpose of the garden is enjoyment and public education. From late spring through fall, the roses present a kaleidoscope of color, form, and fragrance. Visitors can view popular modern hybrids, species, and various classes of Old Garden Roses. All roses are clearly labeled for easy identification and only roses that thrive in central NJ are kept in the garden. The Rose Garden and surrounding Arboretum were part of the original Mettler Estate, which was once a working farm. 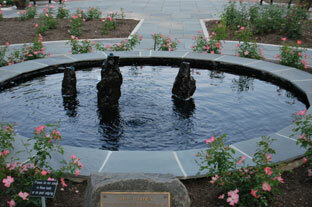 The first section of the garden was developed from features of the Mettler's formal garden. The flagstone walks and small stone pool are original to the estate. Today this part of the garden features modern hybrid roses, tree roses, and The Grandmother's Garden, a section planted with roses popular before World War II. The second section of the garden is framed by a trellis, which supports a variety of climbing roses. The main feature of this garden is the central walk, named in honor of Millicent Fenwick, a New Jersey Congresswoman and United States representative to the United Nations Agencies for Food and Agriculture. The walk is planted with polyanthas and along the garden's perimeter are Old Garden Roses, which are regaining popularity with today's gardeners. The Dutch Garden, which is the third section of the garden, is designed in the formal Dutch style; the raised beds are framed by low growing perennials. Here the collection of old roses is continued, along with modern hybrids. A visit to the garden provides an excellent opportunity to learn about roses and the many varieties available. A visitor interested in adding roses to the home landscape can see the color, size, form, and quality of each rose variety and choose those most suitable for their own gardens. It is also a great place to get away from it all. 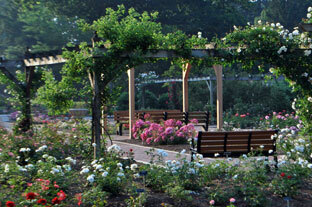 The Rose Garden is a popular location for wedding photography. Although wedding ceremonies are not permitted within the garden, pictures may be taken if a permit is first obtained from the Horticulture Department. Guided tours for groups can also be arranged for a modest fee. The Rose Garden is part of a more extensive Arboretum, which includes the Fragrance & Sensory Garden, the Ornamental Grass Collection, the Perennial Garden, and the Shrub Collection. "A Place of Enchantment and Delight"